You’ve never seen landscapes as dramatic as these! Explore the lochs and glens and mountains and islands of the Scottish Highlands. Natural beauty, alluring castles, ancient ruins, memorable road trips, deep history and warm people await you. Enjoy the hiking, explore the local villages, and take in the setting. Inverness is an inviting city with a vibrant music scene and lots of green spaces. This Untour can be done with a rental car, or you can explore the region by rail. Day trip options: Loch Ness and Urquhart Castle, the Isle of Skye, the Malt Whisky Trail, Cairngorms National Park, Glencoe and Fort William (Ben Nevis), the Culloden Battlefield, Black Isle. 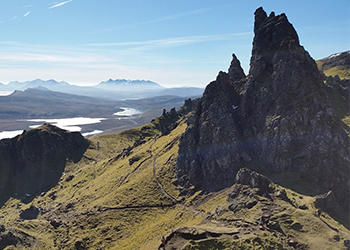 Day trips: Loch Ness and Urquhart Castle, the Old Man of Storr and Isle of Skye, distilleries along the Malt Whisky Trail, Cairngorms National Park, Glencoe and Fort William (Ben Nevis), the Culloden Battlefield, Black Isle, and much more. Sightseeing: Inverness is the capital of the Central Highlands of Scotland and the perfect departure point for exploring this beautiful region. Take a boat ride on nearby Loch Ness and tour the ruins of Urquhart Castle. Cross over to the Isle of Skye and hike its dramatic landscape; see Eilean Donan Castle and Kilt Rock. Tour the Whisky Road and learn about Scotland’s distilling tradition. The scenic North Coast 500 coastal drive is nearby and sections can be done as day excursions. Throughout the region are forts, battlefields, castles, parks, and hiking trails to explore. Get out into the lush green and inviting lakes and glens of this remarkable corner of the UK. Off-the-beaten-track attractions that can’t be beat: Visit some of the smaller, family-owned whisky distilleries like Speyside, where they make whisky in the pre-70s style. Hike the back trails on the edges of the Isle of Skye. Settle into some of the cozy pubs of Inverness for a vibrant trad session, when local musicians drop in to play to play and sing together. Rent a bike and explore the local parks. Or learn about local history at Fort George. Explore archeological sites like the Bronze Age circular tomb at Clava Cairns. Road trip into the countryside. Or try some golfing in the place where the sport was born. One or two weeks in a personally selected apartment in or near Inverness. Transfer assistance for airport arrivals and departures to and from Inverness. Automatic transmission car rental, with unlimited mileage and basic insurance, for the duration of your Untour. A rail pass (additional cost). Discounted Untour with no transit so you can pay as you go by rail and bus. A guidebook for Scotland, a regional map, and further information on-site. A local cultural event, like a traditional tea and storytelling.